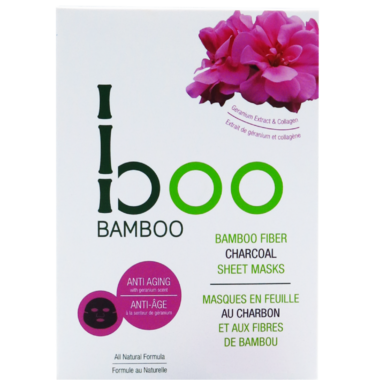 The Boo Bamboo Sheet Mask is made with collagen, geranium oil and Boo Bamboo's special blend of natural fruit extracts to boost cell turnover and give your skin a more youthful glow. This 100% bamboo fibre charcoal mask goes after dull and dry surface cells to uncover your skin’s natural radiance and shine. Ingredients: Water/Eau, Glycerin, Sorbitol, Sodium Hyaluronate, Bambusa VulgarisLeaf/Stem Extract, Lactobacillus/Punica Granatum Fruit Ferment Extract, Soluable Collagen, Malpighia Emarginata ( Acerola) Fruit Extract, Cocos Nucifera ( Coconut) Fruit Extract, Ethylexylglycerin, Polysorbate 20, Xantham Gum, Usnea Barbata ( Lichen) Extract, Zanthoxylum Piperitum Fruit Extract, Pulsatilla Koreana Extract, Allantoin, Eythritol, Adenosine, Geranium Maculatum Oil. Itâ€™s a great mask for the price. Make my skin plumped and hydrated like it was naturally few years ago. Itâ€™s not the best anti-aging sheet mask on the market but itâ€™s coming pretty close. I use it after a clay mask to bring back moisture or the day after I do a peel mask to maintain the glowing and plumbing effects. Made my skin turn red and feel tingly, and I have never reacted to a skin product before. Will look for another natural mask. Great product! Love how my skin glows after using this mask. I normally apply it twice a week for 20 minutes before bed time and the result is awesome. My skin feels soft and looks radiant. Not sure if it was really helping my skin look younger but feels nice and was perfect to scare my husband with when he was getting out of the shower!